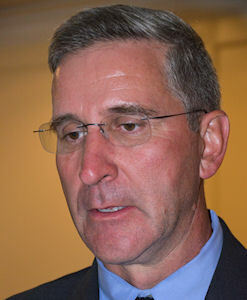 How Pennsylvania agriculture will try to catch up on EPA's Chesapeake model mandates: A conversation with Acting Ag Secretary Russell Redding. June's American Agriculturist issue, soon to arrive in farm mailboxes, tackles the funding debacle of bringing Pennsylvania agriculture into compliance with U.S. EPA's Chesapeake Bay clean-up goals. As previously reported, EPA, U.S. Geological Survey and Chesapeake Bay Foundation have severely criticized Pennsylvania's lack of ag sector progress. PRETTY, BUT NOT PERFECT: Farms upstream from the Susquehanna River will have a crucial future role in meeting the Chesapeake Bay model goals. Q: Given EPA's concerns over agriculture's lack of progress in the Chesapeake WIP goals, how will Pennsylvania address those concerns? A: When I returned to the department, I respectfully said that it was time to reset the conversation. That reset has to happen at the department level as well as with our counterparts with the federal EPA, USDA NRCS, the state Department of Environmental Protection, our ag stakeholder groups and our partners in production agriculture. Continued and enhanced partnerships are key to addressing the WIP goals. As an extension of this dialogue, our department is looking to host a series of farmer town hall meetings. It'll provide a platform for the ag community to speak with one another about best management practices currently in place. Let's be clear: Farmers want to do the right thing. Our nearly 40,000 farm families in the Bay watershed will continue to implement cost-effective conservation BMPs to enrich financial and environmental sustainability of our family farms and the state's waterways. We have to give them credit for the steps they're taking. RUSSELL REDDING: "Stakeholders (farmers and landowners) need to be engaged in this process, allowing us to collect richer data." Q: How does the state intend to gather the necessary data to track and verify Tier 1 compliance with the Bay model? A: With limited resources, we'll need to work strategically within specific areas to gather the data in relationship to the Bay model. That data will demonstrate the work being undertaken and allow us to work with those areas where we can apply needed best management practices. We're ready to partner with our sister agency, the state Department of Environmental Protection, in such an effort. Q: Assuming concentrated animal feeding operations have generally met their obligations, how will state program emphasis shift to address smaller animal feeding operations, croplands and forested lands? A: State DEP staff inspects ag operations for compliance with manure management, erosion and sedimentation control. They inspect in response to complaints, and as a part of a Regional Agricultural Watershed Assessment Program. It's on a routine basis, as resources permit. For specific assessment details, you'll need to speak with DEP directly. Q: Will these farms be required to develop nutrient management plans? If so, what's the timetable? A: Nutrient management plans are currently required by state law for all concentrated animal operations. They're also required by Pennsylvania DEP for all federal CAFOs. County conservation district staff inspects CAOs each year for compliance with nutrient management plans. These plans are reviewed and revised every three years. Q: Will a voluntary incentive approach (Example: Maryland's Certified Agricultural Conservation Steward/Assessment Program) be encouraged via NRCS and/or conservation districts? A: Conservation districts work with the state's farmers on the development and implementation of nutrient management plans, erosion and sediment pollution control programs as well as storm water management. Under Governor Tom Wolf's proposed budget, conservation districts would continue to receive funding through the state Departments of Agricultural and Environmental Protection appropriations, furthering their work with the state's farmers. None of us can do this work alone. Working to protect the state's waterways is the responsibility of more than the state and more than the farmers. This takes work at every level of government. We can continue to do more as we strengthen the power of our partnerships.